4-H members, FARM SMART and DREC staff, and CalFresh staff met again today to further discuss next summer's "Sustainable You!" camp to be held at DREC. 4-H members elected officers to take on responsibilities of the camp and further their leadership skills. 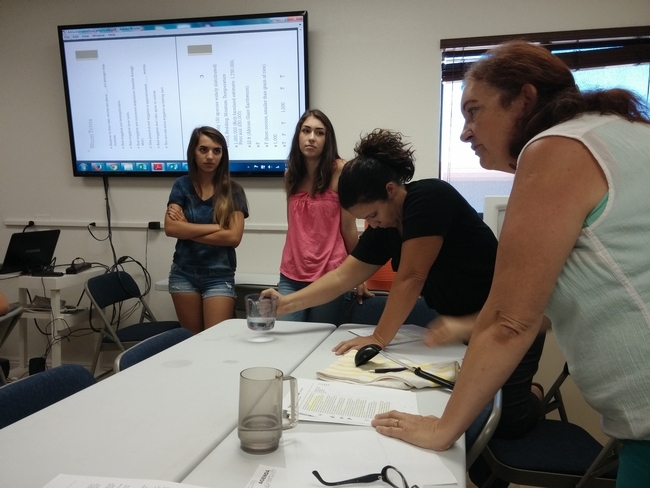 Participants today delved deeper into the curriculum and tried out an activity called "The Importance of Water". Participants discovered just how little precious freshwater is available for use. The next meeting will be held September 10th. Future camp counselors learn about the importance of water. Have you filled up your vehicle's fuel tank recently? Have you eaten a carrot, a pickle, sweet corn, onion, broccoli or melon recently? Had a nice crisp salad with fresh romaine lettuce and some pasta, then dipped some bread in olive oil? How about a stir-fry with tender beef and cooked cabbage or a nice steak? What does all of this have to do with the UC Desert Research and Extension Center (DREC), known by many in our Valley as the “Meloland Station” between Holtville and El Centro? All of these are crops and issues being worked on by researchers and support staff at the here at DREC. The 255-acre Center is part of a larger network of nine similar locations throughout California called the Research and Extension Center under UC's Division of Agriculture and Natural Resources. This Center is an amazing resource for our Valley; it's here to support our most important industry and one that affects us all – agriculture! Just outside my office door, my colleagues are weighing and categorizing wheat grown here at DREC that will be essential to meet European regulations in the future. 90% of wheat grown in our Valley has levels of cadmium (a non-essential metal) too high for the EU. This jeopardizes the export of our wheat to Europe. Wheat breeders are hard at work creating new varieties with lower cadmium levels. Work is also being done to increase disease resistance and salt tolerance. Approximately 150 new hybrid wheat varieties will be created at DREC this year! All of us worry about fuel prices and how they affect our families and local businesses. Researchers at DREC are working with a variety of plants to find viable sources for biofuels. Imagine an Imperial Valley that not only produces geothermal and solar energy, but biofuels as well! We have a suitable growing environment for crops such as sorghum, sugarcane, so-called “energy canes” (Saccharum grasses), and oilseed crops like canola, camelin, and lesquerella. We just lost National Beef; what if we could replace it with facilities that process our local crops into biofuel that powers our vehicles, and do it in an environmentally friendly way? All of these questions are being worked on at DREC! Did you know carrots don't just come in orange? You may soon start seeing shades of purple, red, and other colors at the grocery store. These varieties also carry more antioxidants that our bodies need. Every year in February the carrot plots at DREC are harvested and a rainbow of carrots is analyzed together with researchers from the University of Wisconsin and the USDA. FARM SMART is the outreach arm of DREC. Over 104,000 people have toured the Center since the program began in 2001. We are passionate about educating youth and their parents through our K-12 programs. Every year thousands of Valley youth come to the Center to learn about agriculture, natural resources, and scientific research. We send them home with produce they pick themselves; we hope we send them home with seeds of knowledge and understanding for the future. FARM SMART also partners with CalFresh to deliver nutrition education to our youth. FARM SMART also hosts thousands of “snowbirds” in January and February through our Winter Visitor Program. We educate visitors about Valley agriculture and water issues, and send them home with a sandbag full of fresh produce from the Center. Make sure to sign up for one of our tours next winter if you'd like to experience a day on the farm and learn more about our Valley's amazing agricultural bounty. The Center is here to serve the Valley – not just farmers, but the whole community. DREC is vital to the Valley's future. We'd love to share our research with you. Take a tour next winter. Check out our new website at drec.ucanr.edu and find our research on the research tab to the left. Follow us on Twitter @UCfarmsmart and on Facebook at facebook.com/UCfarmsmart. A strong Valley agriculture doesn't just help growers, it helps us all and it helps our nation. So next time you pick up a fork to eat that delicious meal, thank all those who did so much to get it there on your plate. And think, next year, your carrots might just be purple. Sam Urie is the manager of FARM SMART at the UC Desert Research and Extension Center in Holtville, CA. He can be reached at surie@ucanr.edu or 760-356-3067. On April 17, 2014, UC DREC hosted an Agronomic Crops Field Day. The field day was well-attended by local growers, industry representatives, and researchers. Participants toured the Center on hay wagons. A stop at an alfalfa field included discussion on deficit irrigation research, and highlighted work being done with subsurface drip irrigation. 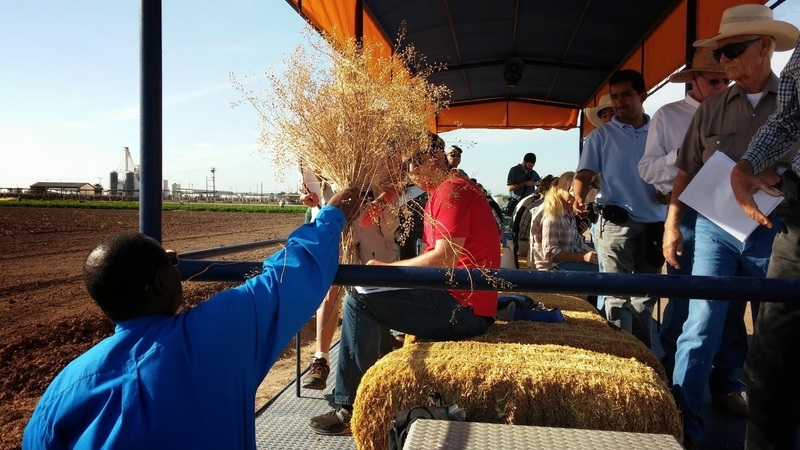 Dr. Khaled Bali declared that "every drop of Colorado River water has been used three times before it arrives in the Imperial Valley" and reiterated the importance of salinity management. Each acre-foot of water (326,000 gallons) brings with it over one ton of salt. So an acre of alfalfa receiving 7 acre feet of water in a year could receive 7-8 tons of salt. 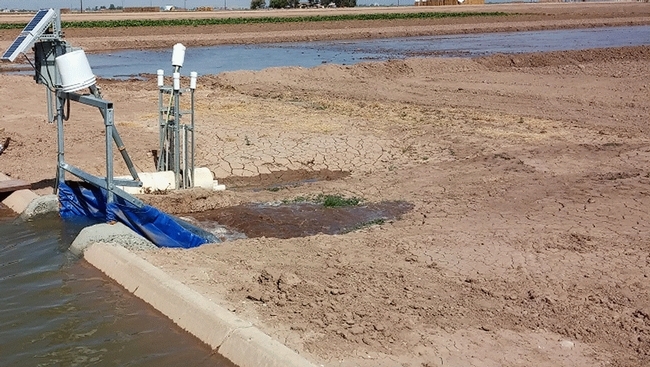 Next to an irrigation canal, Dr. Bali and engineers from the US Bureau of Land Management also demonstrated automated irrigation gates being developed to improve efficiency and lower labor needs. At another stop, Dr. Sam Wang demonstrated his lesquerella plots. Lesquerella is a promising oilseed crop native to the desert Southwest. Other crops shown include sorghum for biofuel purposes and the Center's growing olive groves. Olives are a recent addition to the Imperial Valley's diverse range of crops. The tour concluded with lunch at the Center where participants had the opportunity to network and ask further questions.